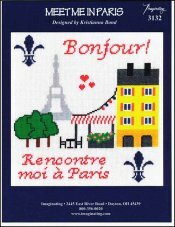 Meet Me In Paris [D6692] - $6.00 : Yarn Tree, Your wholesale source for cross stitch supplies. Cross stitch chart from Imaginating. Designed by Kristianna Bond. Know someone who loves Paris? This would be a great design to stitch for them! "Bonjour!," is stitched at the top of this design. The Eiffel Tower stands in the background with a building and a patio area out front. Stitch count 117 x 128. Stitched on #2936 Zweigart Aida 14ct. White.